"Ragnarok" is not your average show. A lot of folks (noobs) out there are asking us what exactly "LARPing" is, and we want to give you some insight and a little reading material to get you in the mood. We collected the "frequently asked questions" from our fans and are answering them all in this blog! But- just in case you can't be bothered- all of these questions are clarified for you in the production. YOU WILL NOT BE LOST! When we first started developing the script with the LARP community- we were noobs ourselves- so we knew that the production needed to be accessible to all- and it totally is. But, let's get down to business. 1. What is "LARPing"? Or "LARP" or a "LARPer"??? What the heck does that mean? 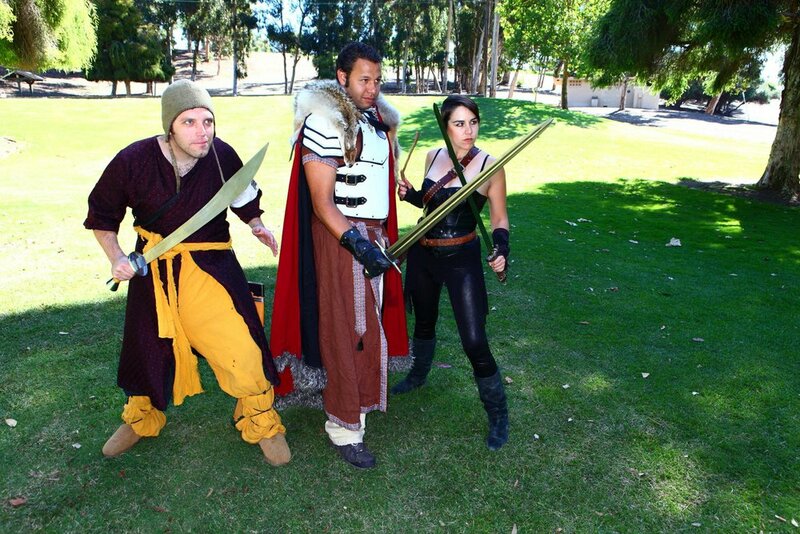 "LARP" is an acronym for "Live-Action Role-Playing." Have you ever heard of Role-Playing games like "Dungeons and Dragons"? Or "Warhammer"? In these games players take on fantasy characters and act out stories to get ahead in the game. There are many different versions of these "Table-Top Role-Playing" games. In Live-Action Role-Playing, these characters meet up in person and act out their adventures in parks, or various locations all over the world. While there are many different styles of "LARPs"- our play focuses mainly on battles, where the characters fight each other with foam weapons. A couple of great reference movies are "Role-Models" or the documentary "Darkon". 2. Where did the title "Ragnarok" come from? While Katie was researching the play, she learned all about the "Ragnarok" festival that happens every year in Ohio. It is a weekend-long event where LARP enthusiasts camp out and battle each other until a clear victory is established. Last year over 7,000 people attended. It roughly means "End of Days" in Norse mythology. And this meaning tied into the theme of our story nicely. You'll have to see the play to figure out why. 3. Are you guys making fun of "LARPers" for the content of the play? Absolutely not. As community-based artists, this is incredibly against what we stand for. Also, after interviewing our subjects we found that there really is little to make fun of. Yes it's abnormal for those outside of the world of Role-playing, but after doing our research we really found very few differences between the "LARPers" and ourselves. The play is reflective of the stories that were shared with us. Many of the words in the play are words that came from our interviews. Nothing is over-exaggerated, or added for our personal humor. The majority of the piece is based-on-truth, or a conglomeration of many truths. Sometimes showing the truth is brutal- but the piece has been approved by the subjects we interviewed- and this is very important to us. 4. Is this show family-friendly? Because your last production, "The Break-Up/Break-Down" was not. Yes! For the most part. We worked very hard to make this piece more appropriate for younger audiences and parents. Every show we do is going to be different. During "The Break-Up/Break-Down" cursing and adult situations were vital to the story- in "Ragnarok" there was less of this content involved. There are a few (very few) adult words, and a few adult situations- but there are a couple. So we say teens and up, but if you have a mature child- it's up to you! We think this production will be very entertaining to families- so bring 'em all! 5. Are there any special discounted or themed nights? Wednesday, November 23rd- Opening Night/ Post-show reception. With your ticket price, you obtain free admission to our post-show reception that will include food, and drink, and the opportunity to mingle with the cast/crew. Friday November 25th- YELP night. Are you a registered Yelp member? Check out our Yelp event info HERE! This is specifically for active Yelp members. Monday November 28th- Industry night! Pay-what-you-can night! Sunday November 27th/ Sunday December 4th- GARB night! Come to "Ragnarok" dressed in any form of "LARP" costume- and get $5 off your ticket price! Wednesday November 30th/ December 7th- Roll the Dice Night! Come early, and mention to our House Manager that you'd like to roll our 20-sided-die. Whatever the number lands on your roll is the number you pay to see the production! Welp, that just about covers the majority of the questions we've been asked leading up to "Ragnarok". We will happily answer anymore that you might have here or feel free to e-mail us at circle@circle2dot2.com! Now get your tickets, or meet us down at the 10th Ave Theater! We are very excited about the hard work that has been put into this one, and we believe this production is accessible and will be enjoyed by all. Now bring on the show!